All the Divine Liturgies offered are in the ancient Byzantine Rite and arranged personally by Father Ivan Kolodiy who is the ULRA Representative for our Eastern Europe Center. Single Mass for the Living Member ... Stipend $ 2000 Single Mass for the Departed Soul ... Stipend $ 2000 List your special intentions: Perpetual Masses ... Stipend $ 2500 for each enrollment (Daily remembrance at the Altar in life and in death) A Triduum of Holy Masses ... Stipend $ 6000 (Three Holy Masses will be celebrated on 3 consecutive days.) 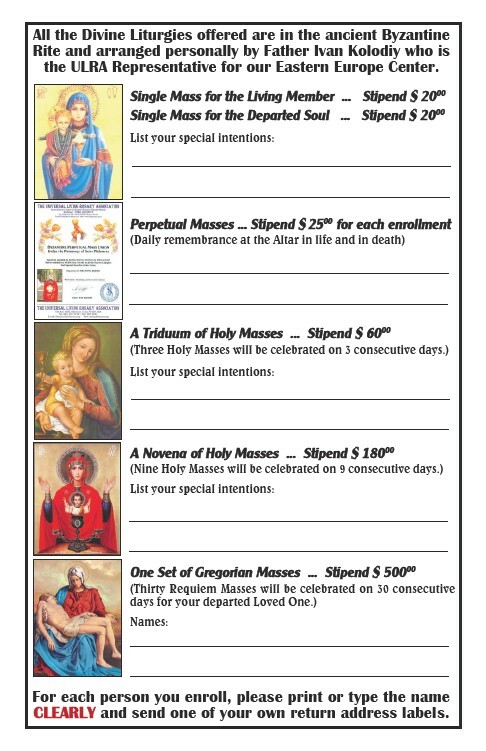 List your special intentions: A Novena of Holy Masses ... Stipend $ 18000 (Nine Holy Masses will be celebrated on 9 consecutive days.) List your special intentions: One Set of Gregorian Masses ... Stipend $ 50000 (Thirty Requiem Masses will be celebrated on 30 consecutive days for your departed Loved One.) Names: For each person you enroll, please print or type the name CLEARLY and send one of your own return address labels.